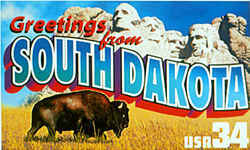 The current state flag of South Dakota was adopted in 1963. 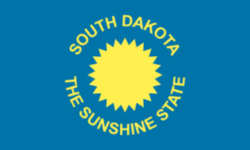 The flag of the state of South Dakota represents the U.S. state of South Dakota with a field of sky blue charged with a version (in navy blue on white) of the state seal in the center, surrounded by gold triangles representing the sun's rays, surrounded in turn by inscriptions in gold sans-serif capitals of "SOUTH DAKOTA" on top and "THE MOUNT RUSHMORE STATE" (the state nickname) on the bottom. The inscription on the bottom was "THE SUNSHINE STATE" before it was changed in 1992. From 1909 until 1963, this flag had two sides - the state seal on one and a large golden sun with lettering around it on the reverse. But when it was decided to keep just one, the designs were combined. The original design was by Senator Ernest May and Doane Robinson, secretary of the State Historical Society. The redesign was done by Will Robinson, Doane Robinson's son. 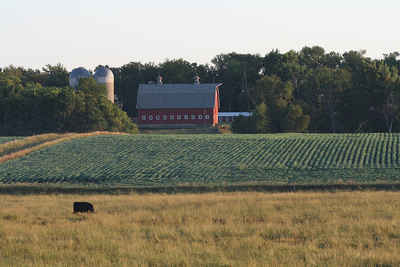 The seal shows a farmer and a rancher, depicting the kind of work of the people of South Dakota. The trees represent the lumber industry, and the river and steamboat, transportation and trade. The gold band is a reminder of the state's nickname.
" The Flag of South Dakota shall consist of a field of blue, one and two-thirds as long as it is wide, in the center of which shall be a blazing sun in gold, two-fifths as wide in diameter as the width of the flag. Above this sun shall be arranged in the arc of the circle, in gold letters, the words 'South Dakota' and below this sun in the arc of the circle shall be arranged the words in gold letters, 'The Sunshine State', and on the reverse of the blazing sun shall be printed in dark blue the Great Seal of the State Of South Dakota. 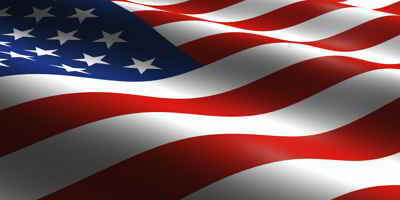 The edges of the flag shall be trimmed with a fringe of gold, to be in proportion to the width of the flag. The staff shall be surmounted by a spearhead to which shall be attached cord and tassels of suitable length and size. The following was reported in the Wi-iyohi (Volume II, November 1, 1948), a monthly bulletin published by the State Historical Society. "In 1909 Senator Ernest May of Deadwood came into the Historical Society office. Seth Bullock wanted a state flag. May asked Doane Robinson about it and was told by Robinson that Ida Anding, now Mrs. McNeil, former operator of KGFX radio of Pierre, who was then a stenographer in the Historical offices, would design him a flag. She did. It was a blazing sun, on an azure background. May liked the design, Senate Bill 208 was introduced. On the floor later, he moved that 'on the reverse of the blazing sun shall appear the Great Seal of the State of South Dakota in dark blue.' This was adopted and the bill passed. Money to buy two flags was appropriated. One went to the Secretary of State, and Seth Bullock of Camp No. 1, United Spanish Veterans of South Dakota, got the other." 55.0108 State flag. The state flag or banner shall consist of a field of sky blue one and two-thirds as long as it is wide. Centered on such field shall be the Great Seal of South Dakota made in conformity with the terms of the Constitution, which shall be four-ninths (4/9) the width of the said flag in diameter; such seal shall be on a white background with the seal outlined in dark blue thereon, or in the alternative shall be on a sky blue background with the seal outlined in dark blue thereon; surrounding the seal in gold shall be a serrated sun whose extreme width shall be five-ninths (5/9) the width of the said flag. The words 'South Dakota' symmetrically arranged to conform to the circle of the sun and seal shall appear in gold letters one-eighteenth (1/18) the width of the said field above said sun and seal and the words 'The Sunshine State' in like sized gold letters and in like arrangement shall appear below the said sun and seal. Flags designed of such material as may be provident for outdoor use need no fringe, but for indoor and display usage shall have a golden fringe one-eighteenth (1/18) the width of said flag on the three sides other than the hoist. All state flags made in conformity with state law prior to the effective date of this act shall remain official state flags, but the creation of a state flag from and after the effective date of this act, other than in conformity herewith, is prohibited." A third change to the flag was made in 1992 when South Dakota adopted "The Mount Rushmore State" as its official nickname and "The Sunshine State" was replaced with the official State nickname on the State flag. The official pledge of the South Dakota flag is "I pledge loyalty and support to the flag and state of South Dakota, land of sunshine, land of infinite variety." The only protocol to the state flag pledge is that it does not either replace or preempt the Pledge of Allegiance to the flag of the United States. South Dakota Code, Title 1, Chapter 4. 1-6-4. State flag--Description. The state flag or banner shall consist of a field of sky-blue one and two-thirds as long as it is wide. Centered on such field shall be the great seal of South Dakota made in conformity with the terms of the Constitution, which shall be four-ninths the width of the flag in diameter. The seal shall be on a white background with the seal outlined in dark blue or, in the alternative, shall be on a sky-blue background with the seal outlined in dark blue thereon. Surrounding the seal in gold shall be a serrated sun whose extreme width shall be five-ninths the width of the flag. 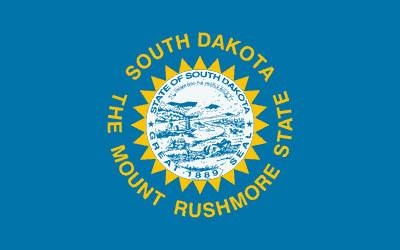 The words "South Dakota" symmetrically arranged to conform to the circle of the sun and seal shall appear in gold letters one-eighteenth the width of the field above the sun and seal and the words "The Mount Rushmore State" in like-sized gold letters and in like arrangement shall appear below the sun and seal. Flags designed of such material as may be provident for outdoor use need have no fringe but flags for indoor and display usage shall have a golden fringe one-eighteenth the width of the flag on the three sides other than the hoist. Source: SDC 1939, § 55.0108; SL 1939, ch 205; SL 1963, ch 419, § 1; SL 1992, ch 1, § 2. Source: SL 1987, ch 4, § 1, 2. 1-6-5. Existing flags remain official. 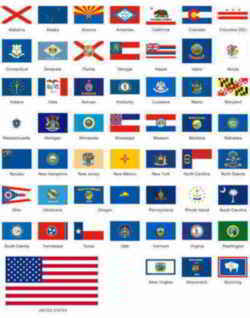 All state flags made in conformity with state law prior to July 1, 1992, shall remain official state flags but the creation of a state flag from and after that date, other than in conformity with § 1-6-4, is prohibited. Source: SDC 1939, § 55.0108 as added by SL 1963, ch 419, § 1; SL 1992, ch 1, § 3. 1-6-6. Sale and loan of state flags--Revolving account. It shall be the duty of the Bureau of Administration to acquire, by purchase or otherwise, and to keep on hand at all times a sufficient quantity of the South Dakota state flags as specified in § 1-6-4, for distribution, loan, or sale, as it may determine, in order to meet the demand therefor from various public, semipublic and private organizations or persons. All funds from the sale of such flags shall be covered into, and there is hereby created within the state treasury, a revolving account known as the special state flag account, from which payments shall be made by the bureau for the purchase of state flags and their replacements as it may deem sufficient from time to time. Requests for the loan of such state flags shall be filled under such rules and regulations as the bureau may establish. Source: SL 1963, ch 419, § 2; SL 1966, ch 171. The Flags of the US.